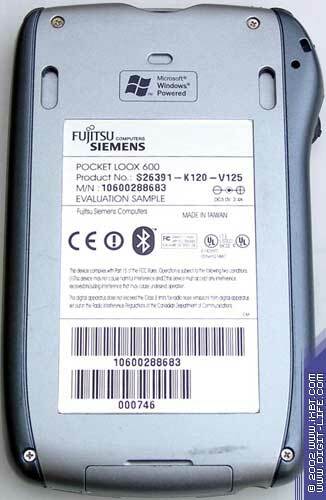 Fujitsu Siemens was the first manufacturer of pocket computers who announced a model on the XScale processor. That is probably why the Pocket LOOX was considered the most long-awaited PDA. The sales of this device are going to start at the end of August - beginning of September. At present, there is only Toshiba e740 with similar functionality. But given to the weight of the LOOX it becomes the best as far as the weight/functions ratio is concerned. This is the second computer after the Toshiba e310 which easily goes into a shirt pocket, though it will weigh it down :-). Its technical characteristics show that the computer stands between the latest iPaqs and the Toshiba e740. It remind the iPaq because of its futuristic design and expandability provided with special jackets. And it inherits from the Toshiba e740 rich capabilities and high functionality. But it's theory. Let's look at the Pocket LOOX in its real life. We got the computer with a full pack of accessories, but it's something like a beta version. That is why let us not judge it too strictly. Inside the box we had the PDA, a cover, a cradle, a charger, a sync cable and two styluses. The pouch is rather cheap and it's not very handy. First of all, each time you want to look at the screen or press buttons you have to fish the computer out. Besides, the LOOX is not safe inside this cover: it doesn't protect from from occasional pressing on the screen or external buttons. That is why you'd better replace it. However, you might not find an appropriate one as the Pocket LOOX is not selling anywhere yet. I hope it won't be a problem soon as the LOOX has every chance to become a bestseller. The charger looks ordinary. It is able to change not only the Pocket LOOX, but also the Casio E-125, Siemens SX45 (aka Andromeda) and Compaq iPaq 3800. I had no other PDAs at hand, maybe it also fits, for example, Jornadas. The sync cable is also usual. It can be connected only to USB. No branches for a com-port are provided. The charger and the sync cable can be connected both to the PDA and to the cradle. It's especially useful for people who don't like carrying a lot of stuff with them: they can take only the PDA and two cables, without the "support". By the way, the cradle makes a good impression: it's not easy to damage it. 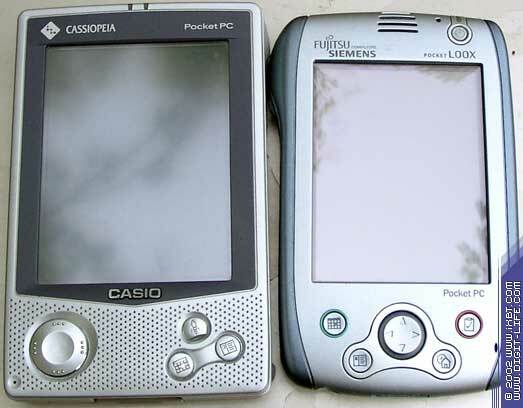 Many owners of other models, for example, Casio E-125, complained about a too flimsy back panel of the PDA. The LOOX's cradle looks very similar to the Casio's one: massive and heavy. But it's not bad. If it can be difficult to put the iPaq 3800 into the cradle, you can easily synchronize the LOOX even in the dark, though the PDA doesn't fall itself into the cradle - you have help it to get in. It's not easy to fish it out of the cradle, even with two hands - but it's a matter of habit. The stylus is very similar to that used for the Siemens SX45: a long "nose" and a metallic case, though the LOOX's stylus is shorter and lighter. The first thing that attracts your attention is that it's small and fits comfortably in the hand. The action cursor is placed naturally under the thumb, below it is the menu button. The forefinger falls onto the dictaphone button above which is a BlueTooth switch. The on/off button is, like on the iPaq, in the upper right-hand corner, above the screen. The LED above it indicates the status: if it blinks green - the battery is charging, if it's just steady on - the battery has finished charging and so on. A light sensor is on the power button's left. The upper part houses a headphones' jack, a stylus and a Compact Flash Type I/II connector. 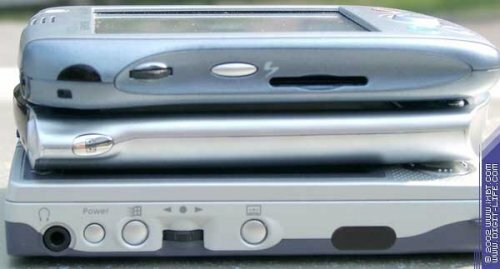 The MMC/SD card slot is on the left side. None of the slots have any shutters. Though the memory cards do not fall out of the slots without any clipping. At default, the CompactFlash slot located on the upper side has a cover, otherwise the hole makes the computer looks queer. Under the screen are 4 buttons and a 5-way navigation joystick. Here you can look through your plans (in the Calendar) or find a telephone number (in Contacts), tasks or all those stuff together in the Today menu. In principle, you can set instructions and applications you like to any button (except on/off one): from an on-screen keyboard to a software start-up of a BlueTooth module. The joystick is not very big; it's very handy for its dimensions, but its location is not convenient - when you hold the LOOX with one hand, it's uncomfortable to operate the joystick for either a right-hand or a left-hand person. The action cursor is located under a certain angle which makes a bit uneasy to press it. But it's much better to do eBook reading with such an action pad than with the iPaq 3800 which possesses only a small joystick under the screen. Several minutes later you understand that such a nice, small and light case doesn't provide an ideal operation. 10-15 minutes after we unpacked it the computer hung up, which was cured only by hard reset. It happened when we ran the SimCity game (for ARM processors) on the PDA with a network adapter connected (though after that the game worked flawlessly). It's interesting that the charging process brought in more bugs, than when the PDA worked unconnected. After that we had to use hard reset two times more. Both times the PDA was in the cradle, or it was connected to the charger, and the computer hang up not when an application was started but without a reason. We left it lying on the table, and 30-40 minutes later we could see only the backlight, - the PDA refused to notice any external "irritants": either the on/off button, or soft reset, or several buttons pressed. The screen is not ideal: it flickers a little. If it were a usual CRT monitor I could say that the refresh rate was too low; but it doesn't happen to LCD. But it's almost unnoticeable: you can notice how it trembles if you look very carefully, in the dark, with the backlight set to the maximum brightness. By the way, the backlight is very bright. The screen of the Pocket LOOX shows much richer and more contrast colors than the leader Compaq iPaq. But irritates a bit that you have to press on the monitor stronger than on other models. Probably, some will like that as it prevents occasional pressing. There is one more bug. When the Media Player is on, even with the screen turned off (you have to add a hardware button for the screen toggle function in the settings), the PDA still reacts to pressing. In case of the Media Player, the play/pause function turns on. The auto backlight has better technical characteristics as compared with other PDAs. Just take the iPaq - the LOOX reacts to a changed light level quicker and changes a brightness level faster and smoother. You must enable the BlueTooth module support twice: on the hardware and software levels. First you must turn on the switch on the right panel, then start the Pocket Plug Free application from the Programs. If you do it the first time the PDA will suggest that you adjust settings, and after restarting the computer you can enjoy all benefits of the wireless connection. The BlueTooth connection was tested with a special adapter for desktop PCs Tecom BT3030. This model provides a high-quality connection up to 100 m provided that the second BlueTooth device is capable of it. But in practice, if the distance is over 6-7 m the computers "lose sight" of each other and stop delivering data. The LOOX had a lot of problems when sending data via the air. It either hung up when receiving a file or wrote that the BlueTooth module was lost :-) or turned off. It was cured with the Soft Reset button. With the Pocket Plug Free program you can establish a local network between two PCs during 2 minutes. Some photos show that we managed to get access to a collection of wma files of over 20 GB, i.e. it's possible right on the PDA to listen to a song, edit a Word document and save it on the PC's drive. Of course, you must set the access rights, otherwise you won't see anything except the Shared Documents folder with several standard Windows pictures. You can handle files located in the PDA's memory from the desktop. In this case in the Entire BlueTooth Neighbourhood folder you will find a list of folders you allowed to be accessed when running the first time the Pocket Plug Free. After installation of the software necessary for functioning of the BlueTooth module you can send files right from the Windows' contextual menu. The same item appears in the Outlook. The first two days the LOOX communicated with the outer world via the BlueTooth module. When we connected it to the PC, the Windows 98 and Windows XP identified it as an unknown USB device though both had the ActiveSync 3.5: the Casio E-125 and the Compaq iPaq 3870 were always identified correctly after reinstallation of the OS. However, quite soon we found the drivers of the LOOX and the ActiveSync also found it at last. The first two days installation of programs and data synchronization were made almost without the ActiveSync. Because to install an application it's necessary to run the required cab-file from the PDA, and any installation program generates such file anyway, moves it to the PDA and runs it. All programs installed onto the PDA are kept in /program files/Microsoft ActiveSync on the hard drive of your desktop. That is why you can take the cab file, load it (we did it over the air) and tap this file in the PDA's conductor. In most cases the programs' distributives are located in self-extracting exe archives. You can extract an installation cab file from such archive with a WinRAR, for example. We, thus, easily installed Resco File Explorer and Picture Viewer. Apart from the program managing the BlueTooth module and other wireless devices the LOOX's OS has some more goodies. First, you can assign programs both for pressing buttons and for holding them. For example, if you just press a side button, the explorer opens, if you hold it for 1-2 sec. - the Media Player starts up. Secondly, if you tick off the "Enable ClearType" in the screen properties, the PDA will display text everywhere (including all menu) with the font supporting the ClearType technology. Unfortunately, the LOOX, unlike the iPaq, can't adjust high and low sounds. But even without it the sound in the headphones is clear and loud (we listened to wma files of 128 kbps). However, the sound coming from a speaker is quite different: the maximum it's able of is to squeak that it's time to charge the battery or go to the meeting. Recording quality of the built-in microphone is not shining. You can record a reminder, for example, to buy bread, but it doesn't suit for recording lectures or interviews. Some sites mention that the Pocket LOOX can't work with two memory card types simultaneously (MMC and CF). I can say that it works perfectly with them, though the data rate is not high: it took about 20 minutes to copy a folder measuring 23 MB with 15-20 files from the PQI 128 Mb CompactFlash card to the SunDisk 128 Mb SD one. It looks like that 1 file of 1MB can be copied from one card onto another during 1 minute :-). The same results were obtained when we copied the data back. Once again I must say that we tested the penultimate version of the Fujitsu Siemens Pocket LOOX, which is mentioned on the back of the PDA: Evaluation Sample. But even now I can say that if the developers correct most of the errors in its software, this model will become a best-seller. The light, attractive and functional device is worth collecting money for it. But now, before the official release, I don't recommend to buy the Pocket LOOX: it has a lot of raw stuff, but the final version should be paid attention to by those who want a pocket computer.